My internet decided to die on me in the middle of a 28-tabling session on Wednesday. So to try and combat this I whipped out my mobile broadband dongle and put it into the computer, only for it to keep bringing up a bloody error message (it turns out T-Mobile suspended my account because I hadn't used it...WTF! It's a Pay As You Go account, surely I can use it if and when I want to?!?!). So I basically had to just sit there clicking refresh on Google Chrome every 30 seconds and occasionally switching my router on and off, whilst trying not to stteaaaammm. It came back online after about 15 minutes, and about 20 tables that I'd survived in popped up. I'd of course lost my chip lead in the 2 I was deep and going well in, and was down to approximately no-big-blinds in the rest. I limped into 7th place in the $7 180-man I was chip-leader in, but somehow managed to luckbox my way into having a bunch of chips on a table I was down peanuts in, and eventually turned it into a 1st place (it was a $3R 180-man), so that officially de-tilted me, but I was pretty lucky to get out of it on this occasion. This is one of the suckiest things that SNG players have to contend with. It's partly my fault, someone who plays as many SNGs as me should have a fully operational back-up...that's why I have a lap-top and a dongle available...but if the lap-top's dead and the dongle doesn't work I guess I shouldn't really complain. My internet connection has been so good since I moved house I'd begun to not worry about it. -cut and I just had to sit there mourning my $1k loss. Even though I play much smaller stakes these days, I'd be $500 worse off if my internet hadn't come back online for another 10 minutes on top, which is a pretty sick loss when you're trying to grind out $3 a game or whatever. 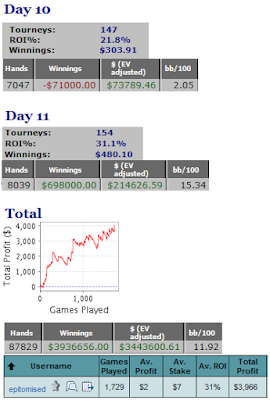 I'm on the most ridiculous downswing in $2 180s which I can't explain, but my $12 180-man results aren't great either. I think I've been calling off and re-shoving a bit light...treating people as if they have a decent-regs range rather than a random donks range, so will be doing some self review and trying to get my ranges back in order. It's the $3 180 rebuys that are saving my arse at the moment and keeping me making profit. 3 Comments to "Disconnected arrgggghhh (+ SNQ Days 10 & 11)"
lol that south park clip is too funny. So true tho! Loss of internet gives me the worst tilt ever. Love the South Park clip. So true.